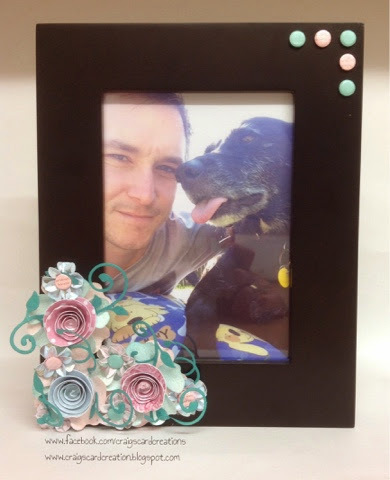 Crafting With Craig: "Smile" photo frame using Stix2 Anything. Good morning, I can't believe the weather this morning. I keep thinking we are going to end up over the rainbow, the wind is so strong. We are out of summer for sure. It a prefect day to get into my craft room with the heating on and a few films on - perfect for some Christmas films. I had this frame kicking about so put a picture of me and DJ in it and decorated it. If you don't know, DJ is the family dog, he's a black lab and he lives with my mum who's lives 2 mins away. When mums at work or away down south visiting my stepdad who works away, I take DJ, I adore him. We were in the back garden in the summer time, lying down when I took a picture of us both, it was perfect timing as he stuck his tonge out. Makes me laugh every time. Die cut plain white flower - S57299. Die release sheets - 57316. 5mm foam pads (for candi) - 57083. Glue gun sticks - S57235. Diecut quilling flowers - Kanban Crafts. Morning dew drops - Kanban Crafts. Swirl die - Tonic Studios. Tonic petal pairs (4 made up) - Tonic Studios. Dark Aqua textured card - Bazzill Basics. Spray and sparkle - Crafters Companion. Spun sugar - Tim Holts distress ink pad. Peacock feathers - Tim Holtz distress ink pad. PLEASE NOTE - I attach all the element to frame step by step. 1- I tool 6 die cut flowers and coloured 3 of them on my craft sheet using a ink distress tool and spun sugar ink pad. Then coloured the other 3 using the peacock feathers. Give a quick pray of spray and sparkle. 2- I lay my swirl die down on the ebosser magnetic sheet. Placed a small piece of the die release sheet on top, then placing my card stock on top of that. Running it through your Ebosser or chosen die cutting machine. Have done this 4 times so I have 4 swirls. TIP - don't bin the release sheet swirl! One of the sides has a coating, so position it on a piece of white card stock. Lay a tea town on top and then using a very low heat iron, iron on top for a few seconds. Best to do this on your craft sheet ontop of a glass mat. Take the tea towel & swirl off. Then take your distress ink pad and tool and ink over the top. The swirl on the card resists the ink and your left with a lovely design. - imagine doing this with such detailed die, will look gorgeous. PLEASE BE CAREFUL WHEN DOING THIS. 3- using your hot glue gun, Attach your die cut flowers ontop of the other, do this so that the spun sugar is ontop of the peacock feathers or vice versa. Then possision these and attach them to the frame. 4- Now take your swirls, and position them over the die cut flowers evenly. Once you are happy with the way it looks secure them with your hot glue gun. 5- Then take your quilling flowers from Kanban Crafts, give them a spray of spray and sparkle and stick in the Center of the die cut flowers, covering up where the swirls have been attached with the hot glue. Place a morning dew drop in the center using silicone glue. 6- Add some card candi in the Center of your Petal Pairs and then attach them evenly over your layout using your glue gun. Add some card candi in the top right had side of your frame.